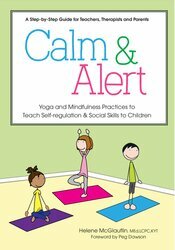 Calm and Alert gives classroom teachers, special needs teachers, therapists, yoga teachers and parents an innovative, step-by-step approach to teaching self-regulation and social skills to children by utilizing their body, mind and breath. Developed by an experienced counselor, educator, and yoga teacher, Helene McGlauflin, Calm & Alert is filled with unique mindfulness exercises, yoga poses and lesson plans to help both typically developing and special needs children. Helene McGlauflin, MEd, LCPC, KYT, is a counselor, yoga teacher and writer. Helene has worked with and for children and those who raise and serve them for 30 years.